Notes is an electronic notepad for your Mac. A note is a convenient place to jot quick notes, recipes, phone numbers, or whatever. Some notes are shown here. 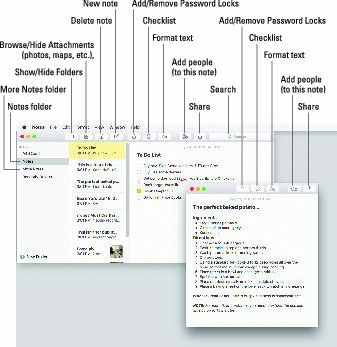 Notes is for making notes on your Mac. To create a new note, choose File → New Note; press ⌘+N; or click the button with the little square and pencil in the toolbar. Double-click a note to open it in its own window so you can drag it around onscreen by its title bar. After opening a note in its own window, if you want the note to float in front of other windows so it’s always visible, choose Window → Float on Top. Change text to any font, color, size, and style by selecting it and using the myriad of tools in the Format menu. Search for a word or phrase in any note by typing your query in the Search box. Create bulleted, numbered, or dashed lists by selecting the text and choosing Format → Font → Lists. Create folders to organize your notes by choosing File → New Folder, pressing ⌘+Shift+N, or clicking the New Folder button at the bottom of the Folder list. The Notes window must be selected to create a new folder. If a note in a window is active, the New Folder command will be unavailable. So click the main Notes window if the New Folder command is grayed out. Or click the New Note button in the toolbar, which is enabled even when working with a note in a separate window. Folders in the Notes application are exclusive to Notes. In other words, the folders described in the following bullets aren’t folders in the Finder. You won’t find them on your hard disk; they live only in the Notes app (and iCloud or other Internet accounts if you’ve enabled them). And also remember that folders are strictly optional. If you don’t have a ton of notes, keeping them all in a single folder and using the Search box to filter them may work for you. Show or hide the Folders list by choosing View → Show/Hide Folders or clicking the Show/Hide Folders button in the toolbar. Show only Notes in a folder by clicking the folder name in the Folders list, or click All iCloud to see all your notes. Automatically sync notes with your iDevice by using iCloud or other Internet Accounts by choosing Notes → Accounts, which will open the Internet Accounts System Preferences pane; then click the appropriate Internet account — such as Office 365 or Gmail — and enable its check box to sync Notes. Send the contents of a Note via the Mail or Messages apps by choosing File → Share or clicking the Share icon. Print a note by choosing File → Print or pressing ⌘+P. Whatever you type in a note is saved automatically as you type it, so Notes has no Save, Save As, or Duplicate commands. Other Notes goodies include a spell checker, spoken notes, text substitutions (such as Smart Quotes and Smart Dashes), and transformations (such as Make Upper or Lowercase). You can find all these options on the Edit menu. You can drag and drop photos, PDFs, videos, and other files into a note, something that wasn’t possible in Notes prior to El Capitan (10.11). The Attachments browser displays every external file you’ve dragged into every note in a single place, making it easier to find things. Click the Attachments button in the toolbar to see this feature in action; click the Attachments button again to go back to your notes. Use the Share menu in apps such as Safari and Maps to add content to Notes. You can add checklists (in addition to bulleted, numbered, and dashed lists), as shown in the to-do list in the middle, by clicking the Checklist button in the toolbar, by choosing Format → Checklist, or by using the shortcut ⌘+Shift+L. New in Sierra is the ability to share notes with others and allow them to edit them. Here’s how it works: Click the Add People button in the toolbar and choose how you’d like to send your invitation: Mail, Messages, Twitter, Facebook, AirDrop, or Linked In. If the person you invite is also running Sierra, she’ll see the note in her copy of Notes; if they’re running any other operating system, the note will open in the iCloud website for editing. When she’s done, you’ll see her edits in Notes on your Mac within a few minutes. You now know everything you need to know to use and enjoy Sierra’s new, beefed-up Notes app!